Around Silicon Valley, semiconductor giant Nvidia is best known for its graphics chips that power a wide range of video game technologies. But in recent years, the company’s growth has also been fueled by its investments in autonomous and connected car technologies. Riding that wave, Nvidia recently made clear that autonomous trucks are a priority as well. Nvidia just launched a partnership with Paccar — maker of the Kenworth, Peterbilt and DAF truck brands — to collaborate on the development of an autonomous truck platform and artificial intelligence. 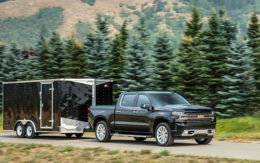 Though this is the company’s first public discussion of big rigs, it has been quietly inching in this direction for some time. Like many technology companies playing in connected and autonomous trucks, it’s become increasingly clear to insiders at Nvidia that trucks are likely to lead the revolution. Of course, such interest isn’t as surprising as it might once have seemed. Just last month, another semiconductor giant, Intel, made a deal to acquire autonomous driving technology company Mobileye for $15.3 billion. The move pushes Intel even deeper into the self-driving car and truck space. Founded almost 25 years ago, chip rival Nvidia’s main business involves making a graphical processing unit, or GPU, which powers some of the most advanced digital visualization and computer graphics on the market. The company also makes chips that combine GPU and the more traditional computer processing unit, or CPU — the brains of a computer. Starting about 10 years ago, Nvidia created an automotive unit to leverage its visualization prowess, Shapiro said. Gaming-related sales still account for about two-thirds of Nvidia’s revenue, and automotive is the smallest of its four main businesses. But automotive-related revenue has increased almost 250 percent over the last two years. At the beginning, a lot of the automotive business was simply enabling design via 3-D models. But it turns out that advanced visualization technology is crucial for autonomous vehicles. “You need to be able to instantly re-create the world around you in a computer model and understand it with extreme accuracy,” Shapiro said. To that end, Nvidia has been developing its Drive PX AI car computing platform and DriveWorks software, which allows vehicles to receive wireless updates to upgrade features. These systems can take all the data being collected by the growing array of sensors, cameras and Lidar in a vehicle, process it, analyze it, build a model around it, and then make decisions. Like most self-driving systems, this is evolutionary, with the company saying it will soon offer Level 3 technology. Level 3 references a five-level scale that traffic safety regulators developed to assess vehicle automation. At this level, a car can operate autonomously with some driver intervention. A Level 5 vehicle is fully automated with a system that can perform all driving tasks. By 2018, it projects Level 4 capability. The company has been developing this platform with a wide-range of automotive partners, including Tesla, Audi, Bosch and Mercedes-Benz. Some of these partnerships may have evolved to include trucks, Shapiro said. And earlier this year, Nvidia unveiled a partnership with ZF, a supplier to the trucking and automotive industries. But the partnership with Paccar lets Nvidia talk more directly about what it sees happening in the trucking world. Paccar said it has created a “proof-of-concept self-driving truck” with Level 4 capability built using Nvidia’s Drive PX platform. For its part, Nvidia has been eager to highlight the quickly developing opportunity given the 300 million trucks on the road driving 1.2 trillion miles annually. Shapiro echoes what many others have noted: That the economic imperatives will likely lead to faster adoption and deployment of autonomous technologies for trucks as opposed to cars. 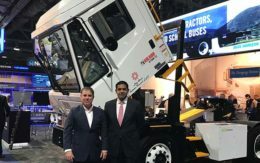 The increased savings, efficiencies and safety promised by self-driving trucks, or even just trucks with greater artificial intelligence, mean fleet owners will be more willing to invest in the technology in the near term, he said. Partnerships like the one with Paccar will help Nvidia develop its platform, he said. And while there are no additional details to reveal now, Nvidia will likely have more to say at its own user conference next month, Shapiro said. That event includes 39 sessions on topics related to self-driving vehicles, including one presentation on platooning and automated trucks.